Enjoy the sights of Yellowknife and take in a spectacular Aurora Viewing or sign-up for one of our other tours: city tour, dog mushing, buffalo view and more. 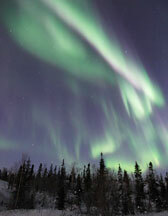 Watch the Aurora dance across the skies while out on a frozen lake or on a snow covered hill. We also offer dog sledding, Aboriginal Ice Fishing and more. Yellowknife is the capital of Canada’s Northwest Territories, located directly under the Aurora Oval, a narrow band encircling the polar reaches of the globe in which the mysterious green light of the Aurora Borealis are at their most brilliant. Coupled with its clear cold nights, this favorable geographic location makes Yellowknife consistently one of the best places in the world for Aurora viewing. From our strategically located a few kilometers out of town and far from any man-made light,our guests experience dramatically across the night sky. The Aurora Borealis, or Northern Lights, are actually giant electrical storms formed by solar flares from the sun reacting with the earth’s magnetic field. Although they are usually about 100-500 kilometers above the earth’s upper atmosphere, up here in Canada’s north, our guests often feel that they can reach out and touch them. "Aurora Wonderland" is Operated by Beck's Kennels in Yellowknife. 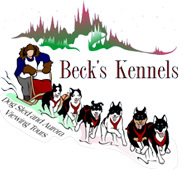 Beck's Kennels has been hosting visitors in Yellowknife since 1989. Based on this extensive experience, we offer flawlessly coordinated, quality tourism products with friendly, professional service in both English and Japanese.